Virginia Overton, Untitled (Suspended Beam), 2018. 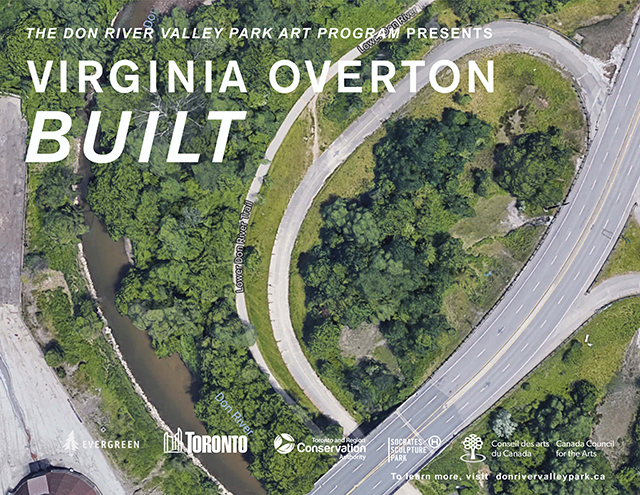 Built, an outdoor exhibition by artist Virginia Overton in the Lower Don Valley, is now open to the public. Built is presented in partnership with Socrates Sculpture Park in New York and will feature a year-long installation along the Lower Don Trail and additional sculptures at Evergreen Brick Works. In her work, Overton looks closely at the ubiquitous industrial and natural materials used in infrastructure across North America. She re-purposes the familiar objects found in cities, rural environments and in the places she works: the steel I-beams, logs, wooden joists, salvaged pipes in all kinds of metals, gantries, motors and pick-up trucks seen from city to city. In Built — originally commissioned by Socrates Sculpture Park and adapted for the Don River Valley Park — Overton brings these materials together in unexpected new sculptural forms that explore issues of circulation, adaptation and reuse, and reflect our surroundings in cities like Toronto and New York. The centerpiece of the Toronto exhibition is a sixteen-foot salvaged pine beam suspended from a found steel gantry, which Overton has transformed into a massive communal swing. In Toronto, Overton will also create new sculptures from materials found in local scrap yards and on the city’s streets; these new works speak further to the material language of Toronto’s urban environment and the ways in which urban and rural, industrial and post-industrial, converge in places like the Don Valley. The sculptures are located both on the Lower Don Trail and at the quarry at Evergreen Brick Works. Walk south along the Lower Don Trail from the Pottery Road Trail entrance (approx. 1 km). Walk North from Riverdale Park Footbridge (approx. 1km). Virginia Overton was born in Tennessee and currently lives and works in New York. Solo exhibitions have been presented at Socrates Sculpture Park (Long Island City), The Fogelman Galleries of Contemporary Art at the University of Memphis, Museum Of Contemporary Art Tucson, The Whitney Museum of American Art (New York), The Aldrich Contemporary Art Museum (Ridgefield), White Cube (London), All Rise (Seattle), Museum of Contemporary Art North Miami, Storm King Art Center (Mountainville), Westfälischer Kunstverein (Münster), Kunsthalle Bern, The Kitchen (New York), and The Power Station (Dallas). Recent group exhibitions and projects include Frieze Sculpture (London), FRONT International: Cleveland Triennial for Contemporary Art, Office Baroque (Brussels), MAY68 (New York), Maisterravalbuena (Lisbon), Lever House (New York), The David Ireland House at 500 Capp Street (San Francisco), Institute of Contemporary Art (Philadelphia), Parcours (Art Basel), Contemporary Art Museum (St. Louis), High Line Art (New York), MoMA PS1 (New York), and SculptureCenter (New York). Her work is collected by The Whitney Museum of American Art, The Museum of Modern Art, New York, Museum of Contemporary Art Tucson, Kunstmuseum Bern, and Kunsthaus Zürich. Upcoming solo exhibitions include Francesca Pia Gallery (Zürich) and Bortolami Gallery (New York), and a record release with Future Audio Graphics in New York. Socrates Sculpture Park was founded in 1986 by visionary sculptor Mark di Suvero as a community engaged, accessible arts space dedicated to supporting artists in the production and presentation of public artworks. Co-presented by Evergreen with the City of Toronto and TRCA, the Don River Valley Park Art is a series of temporary, site-specific public art projects sited along the Lower Don River, curated by Kari Cwynar. The Toronto presentation of Built is made possible thanks to Socrates Sculpture Park and thanks to the support of the Canada Council for the Arts. The event is located both on the Lower Don Trail and at Evergreen Brick Works.